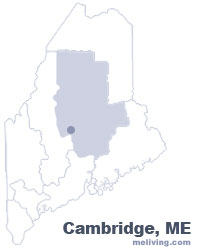 Cambridge, Maine is a small town located in Somerset County. At the 2000 census there were 492 people living in the town. Cambridge was most likely named after Cambridge, Massachusetts. To share any Cambridge, Maine information with us, please contact us. Learn more about advertising in MELiving.